Well, that didn't take long. Last week a permit was issued for the demolition of the one-story building at 927-929 W Irving Park Road, which dated back to 1919, but was aging poorly. By this evening, all was gone except the front wall. (You can see what it looks like from the back on Curbed Chicago). Most recently, 927 West Irving was the home of Asian Delight restaurant. When it closed during the summer of 2014, it joined the 929 side in having its doors and windows covered with plywood. We never were inside the building, but even from the outside, you could see the west half (929) noticeably sagging and pulling away from 927 half. We love vintage architecture, but sometimes buildings are just too far gone to save, and that appears to have been the case here. Someone who posted on the Forgotten Chicago Facebook page went into the rubble this week and liberated some of the decorative terra cotta ornamentation. 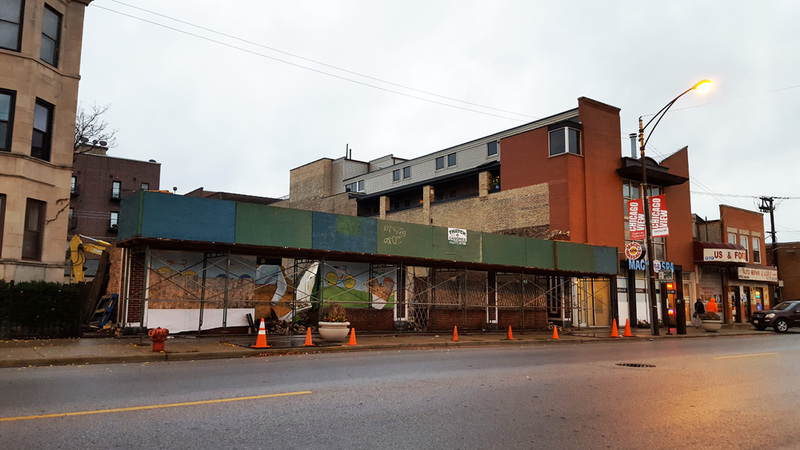 We were hoping that the property wasn't yet another victim of "Thorek Flats," the process by which Thorek Hospital is methodically acquiring properties near it, tearing down the buildings, and leaving the lots undeveloped and empty for years. So we did a little research. 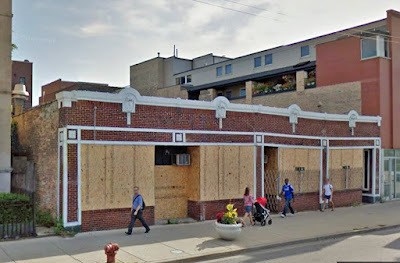 According to the wrecking permit, the owner is a company called 927 W Irving, Inc. and its principal is Dave Gassman. He's the developer who plans to redo the 3800 block of Broadway, and who built a new rental building at 4520 North Beacon. Since he's a developer, rather than a land banker, we look forward to seeing what happens on that portion of Irving Park Road. Update: The plans for a new building have been filed with the city, per Curbed Chicago.